Production: Mosfilm (USSR) and ICAIC (Instituto Cubano del Arte e Industrias Cinematográficos); black and white, 35 mm; running time: 141 minutes. Filmed in Cuba; released 1964; released in United States, 1995. Rudina; sound: Vladimir Sharun, Rodolfo Plaza (assistant); special effects: Boris Travkin, A. Vinokurov. Cast: Luz Maria Collazo ( Maria/Betty ); José Gallardo ( Pedro ); Sergio Corrieri ( Alberto ); Raúl Garcia ( Enrique ); Celia Rodriquez ( Gloria ); Jean Bouise ( Jim ); Roberto García York ( American activist ); Luisa María Jiménez ( Teresa ); Mario González Broche ( Pablo ); Raquel Revuelta ( The voice of Cuba ); Salvador Wood; Alberto Morgan; Fausto Mirabal; María de las Mercedes Díez; Bárbara Domínquez; Jesús del Monte; Tony López; Héctor Castañeda; Rosenda Lamadriz; Robert Villar; Roberto Cabrera; Alfredo Ávila; José Espinosa; Rafael Díaz; Pepe Ramírez; Isabel Moreno; Manuel J. Mora; Aramis Delgado. Awards: National Society of Film Critics Archival Award, 1995. Bogomolov, Iurij, Mikhail Kalatozov: stranicy tvorcheskoj biografii , Moscow, 1989. Zorkaya, Neya, The Illustrated History of the Soviet Cinema , New York, 1989. Hill, Steven P., "The Soviet Film Today," in Film Quarterly (Berkeley) vol. 20, no. 4, Summer 1967. 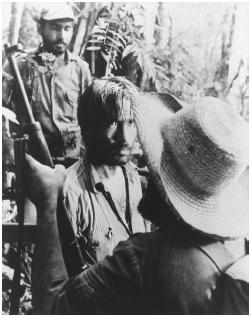 Thomajan, Dale, " I Am Cuba : Handheld Heaven, Agitprop Purgatory," in Film Comment (New York), vol. 31, March-April 1995. Iordanova, Dina, " I Am Cuba ," in The Russian Review , vol. 56, January 1997. Hoberman, J., "I Am Cuba," in The Red Atlantis: Communist Culture in the Absence of Communism , Philadelphia, 1998. Morris, Gary, "The Poetry of Revolution: I Am Cuba !," in Bright Lights Film Journal , no. 23, December 1998; http://www.brightlightsfilm.com/23/iamcuba.html . Smith, Paul Julian, " I Am Cuba ," in Sight & Sound (London), no. 8, August 1999. Turksib and Salt for Svanetia (videorecording), New York, Kino on Video, 1997. I Am Cuba is a masterpiece from the USSR, co-produced with Cuba in a grand style with a large Communist Party budget by two of the greatest cinema artists from the Soviet Union, director Mikhail Kalatozov and cameraman Sergei Urusevsky. It was the success of Kalatozov and Urusevsky's 1957 classic, Cranes Are Flying (which won the Palme d'Or at Cannes in 1958), that landed them the film and a prolonged stay on the island that fascinated so many Soviets in the early 1960s. Set in pre-Castro days, I Am Cuba presents four separate stories of poor and downtrodden victims of capitalist and imperialist exploitation who are brought, individually and personally, to revolution. In episode number one, a beautiful Cuban girl, dressed in white, meets with her fiancé (a handsome fruit dealer and a political activist) in front of a church, as he speaks of their upcoming wedding. She subsequently goes off to her night job—into the dark and decadent space of an exclusive jazz club catering to tourists, where she works as a prostitute. Her customer insists on spending the night in her home, where her fiancé happens upon the morning aftermath of this transaction. In episode number two, an old sugar cane farmer, a widower, loses his farm to local barons and the United Fruit Company, and torches all of his fields. Episode three features a young student revolutionary who rescues a local girl from a stalking group of inebriated, American sailors looking for prey and is later killed in a demonstration—proud, resisting martyr to an evil regime. Episode four moves to the Sierra Maestra mountains, where a peasant refuses to join the liberation forces until his hut and his family are hit by an aerial bombing attack by the Batista regime. While some Americans may object to the stereotypical depiction of the United States and U.S. citizens in the film, it should be noted that the film was labeled "anti-revolutionary" in Cuba and accused of "idealizing the Yankees" in Russia. Resisting a single reading, I Am Cuba is a moving testament to the Cold War and to some of the most dramatic moments of that war—the stand-off between the United States and the Soviet Union in relation to Cuba. It is not the story line of the film that has caught the attention of cinema audiences world-wide, however, but its dramatic, passionate, and impulsive cinematic style. Accused of "formalism" or "art for art's sake," and said to lack drama and personal interest, I Am Cuba received stern criticism in official Soviet publications and was a boxoffice failure in Russia in the 1960s. It was, however, the daring cinematic style and technical sophistication of the film that was responsible for its second birth in the 1980s in the West, where it has been hailed as "the greatest Soviet film since the 1920s" by Steven P. Hill, and "a supreme masterpiece of the poetic documentary form" by Gary Morris. Fascinating film-makers and professionals with its unbelievable angles and shots, I Am Cuba uses a bold, reckless, hand-held camera that rises and falls, tips and sways with a Latin beat to look at the world through a wide-angle, 9.8 mm lens, flattening and distorting many of the film's images. The infrared film stock chosen by the director further heightens the emotion of the film, bringing black and white into stark contrast. Penetrating into the life of the island, into the rhythm of a culture for sale, pursuing and following, the film presents the spectator with elaborate crane shots and extreme long takes "that make Welles' Touch of Evil seem mild," according to one critic. The unusual tilts and unexpected camera angles recall early Soviet film, especially propaganda films, or agit-prop, but depart from traditional uses of those angles, hence undermining simple readings and challenging viewer expectations. While much credit for the unusual camera work has been given to cameraman Urusevsky, many elements of the film style must be attributed to Kalatozov, who began his cinema career as a cameraman at the Georgian Film Studio in Tbilisi (Tiflis) in the 1920s. All of Kalatozov's films are marked by his signature style—striking, unexpected camera angles, the dramatic use of light and shade, a freewheeling hand-held camera, perpetual motion shots, swish pans, and 360 degree horizontal pans. The dramatic sequence so often cited in descriptions of I Am Cuba —where the camera descends, slowly, from a bikini fashion show atop a Havana high-rise hotel, to the swimming pool at the base of the building, and dives under water, to gaze upon more girls in bikinis swimming with Urusevsky (who holds the camera? )—was a modernized, technically improved version of the trip up the side of an ancient tower and a rushing descent (like a rock, hurled at an invader), in Svanetia, high in the Caucasus Mountains, from Kalatozov's film of 1930, Salt for Svanetia. The script for I Am Cuba was written by Russian poet Yevgeny Yevtushenko, with Cuban poet Enrique Pineda Barnet, and is limited to the voice of Cuba herself, a first person narration intoning the sad fate of Cuba, invaded, exploited, raped, pillaged, and sold to the highest bidder. Some of the most unforgettable sequences in the film include the arrival in Cuba, by air and by water; the descent of the camera from the sky-scraper fashion show (mentioned above); the fire in the sugar cane field; and the escape of the American tourist from the neighborhood where he took his pleasure from a local girl.